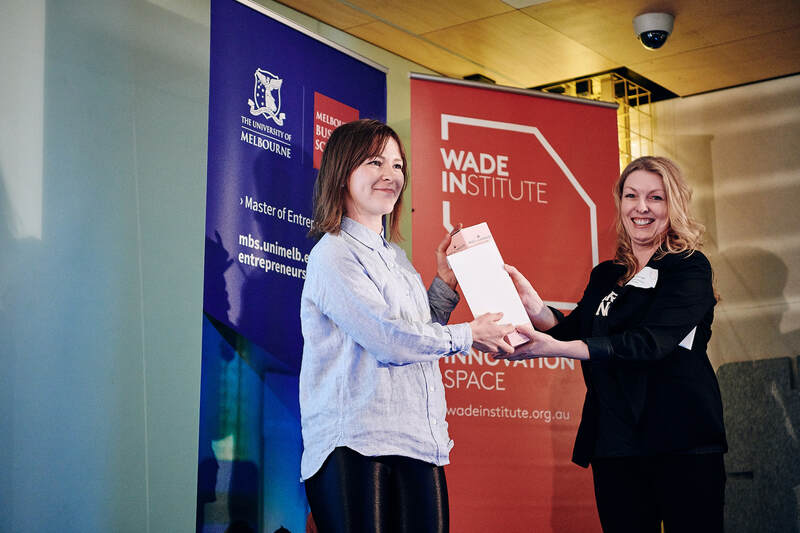 What a night for emerging entrepreneurial talent! Seven teams gave their startup pitches their all for a chance to win up to $10K in seed funding. 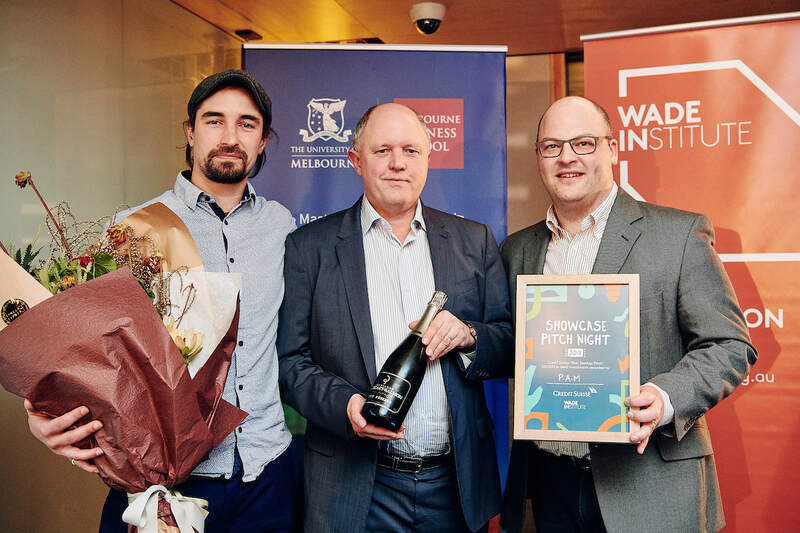 From regtech to sustainability, HR and more, the University of Melbourne’s Master of Entrepreneurship students tackled some pressing problems and big market opportunities, both locally and globally. We were thrilled to be joined by some powerhouse panellists – entrepreneurs, intrapreneurs and investors with plenty of skin in the game when it comes to new ideas. The winner of the Credit Suisse ‘Best Startup Pitch’ Award –Curvecrete. Managing Director of Credit Suisse Shane Galligan (centre) with cofounders of Curvecrete, Daniel Prohasky (left) and Warren Rudd (right). Curvecrete is a new robotic mould that easily creates curved concrete panels with minimal waste. 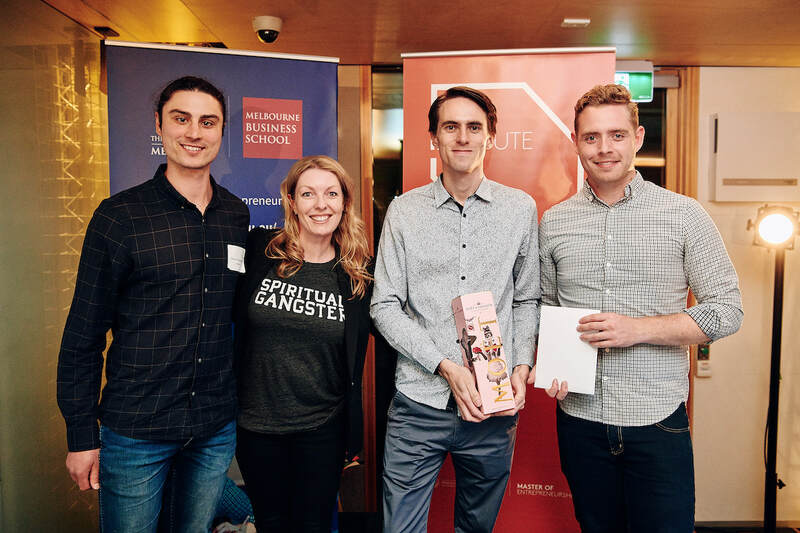 Congrats to cofounders Warren Rudd, Daniel Prohasky and Paul Loh, winners of $10,000 in seed funding thanks to Credit Suisse. (From left: Founder Claire Bremner and MYOB Account Executive Jo Carroll). (From left: Cofounder Andrea Zhu, MYOB Account Executive Jo Carroll, and cofounders Laven Cao and Kane Guo). 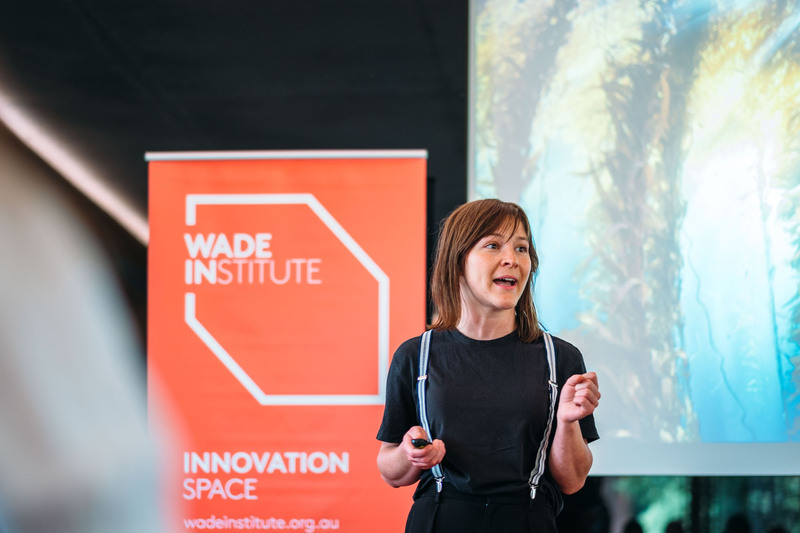 Congratulations to Claire Bremner, Founder of sustainable kelp food company KELPD, who has been named our surprise winner of the Creative Innovation Global Exponential Leader Scholarship. 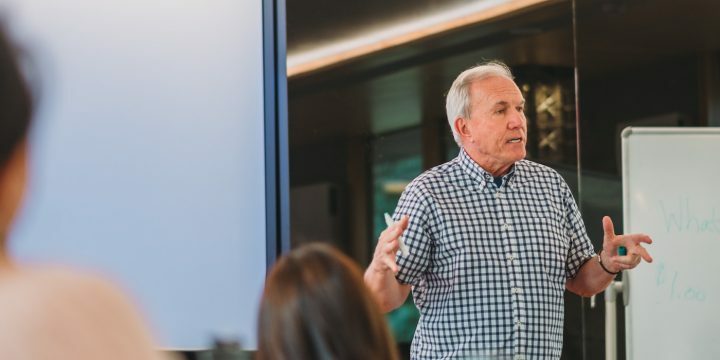 Thanks to Creative Innovation, Claire has a full place to attend and present at the Creative Innovation 2019 Asia Pacific conference, 3 months free hot-desking at Dimension5 co-working, and more! Our business provides customised fresh pet food in China. Fresh pet food is a new concept in western countries such as Australia and the US, and its popularity is rapidly increasing. However, the Chinese market is underserved. With the rise of the middle-upper class, there is a need for this product and it is perfect timing to enter the dog food market in China. Silfresh is an environmentally friendly packaging company tailored to the food industry. We provide butchers, delicatessens and supermarkets with reusable and cost effective solutions to single-use plastic. With 600 tonnes of cling-wrap waste being produced each year, we’re helping the food industry move towards a growing circular economy. 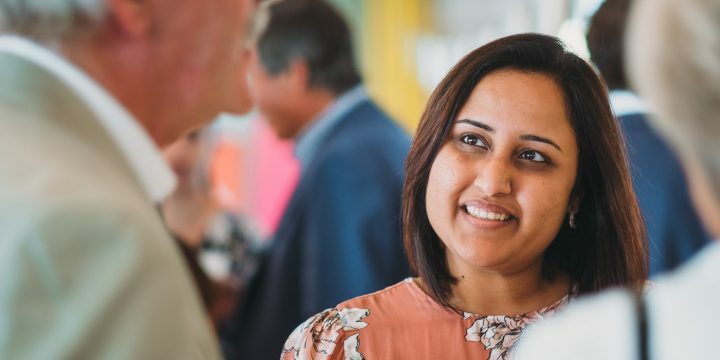 Codello is a next generation skill-based shift swapping app designed to enable nurses and midwives to better balance their careers and personal lives. By supporting flexible work, hospitals (our customers) are able to reduce clinical risks while ensuring compliance to nursing ratios. They can also provide a highly valued staff benefit to attract, engage and retain their talent. Tyki is a platform that connects cafes and restaurants with Instagram users to facilitate an exchange of food for a photo. Influencer marketing can be an effective marketing tool for global brands because influencers have large global followings. 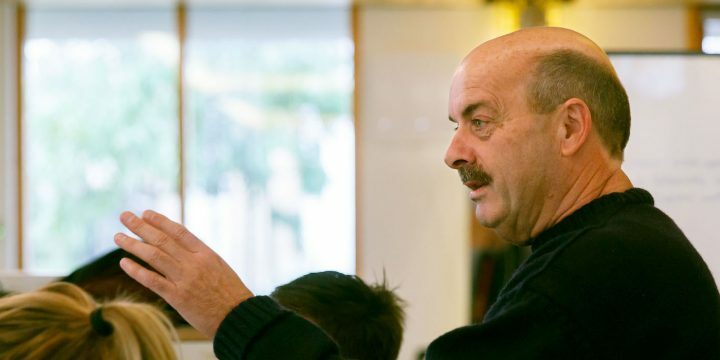 However, it is ineffective for small businesses, such as cafés and restaurants, who only require local engagement. Tyki makes the right connections between businesses and Instagram users who have proven local followings. Curvecrete is a new robotic mould that easily creates curved concrete panels with minimal waste. Current processes often require single-use moulds, which is inefficient and uneconomical. Our technology addresses this, enabling the creation of inspiring designs for the cities of the future. People around the world are looking for more nutrition in their daily diet. We develop everyday products that include one of the most minerally rich and versatile ingredients on the planet: kelp! We’re starting with food condiments. By forming alliances with local farmers and artisans, we develop delicious, unique products that support a sustainable food system. Avocardo is a smartphone app that saves occasional drivers up to 60% on their insurance bill. We offer a new kind of insurance where you only pay for the kilometres you actually drive – meaning you get a fairer price that represents how you actually use your car day to day. Check out our Facebook livestream to catch up on all seven pitches. 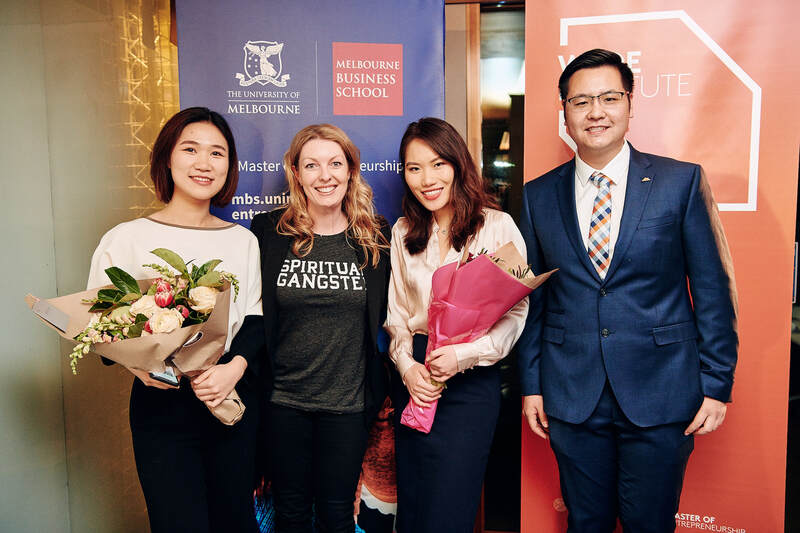 Congratulations to all who pitched, and to all 2018 University of Melbourne Master of Entrepreneurship students for their amazing achievements this year. We can’t wait to see where your newfound entrepreneurial skills take you!